Aspire to Enlightenment, Engage People, Awaken the World! Through this movement of Organic Buddhism, we uphold the teaching given to us in the title of the Lotus Sutra. What this means is that we find the characteristics of our movement through life from the nature of the Lotus Flower. In reading about how to grow a real lotus flower from the seed, I learned a lot about the nature of our practice and received some insight into the nature of Organic Buddhism. It should be noted that from my research and experience, lotus flowers are very difficult to grow in captivity. They require mostly the perfect conditions only found in nature and are hard to reproduce in captivity. This is what is meant by Organic Buddhism. We cannot grow the Buddha-natures of all beings to aspire and take refuge in the enlightenment taught by the Buddha in the Lotus Sutra by simply creating the conditions based on our comfort zone and sterile space. We need a strong ecosystem full of all kinds of nutrition that only nature can create. The optimal place to grow is actually a complicated system of mud, water, pond scum, and weather. Is it not possible to grow such a thing in a fish tank and pure water. It would be very difficult if not impossible due to it lacking all the necessary causes and conditions associated with nature. Looking at information about starting a Lotus flower from seeding, the seed needed to have a few scars made by a metal file. Without doing this it would not grow and may even rot. From this I realize that the scars that we have from our lives are what allow the Lotus Seeds in our hearts and minds to sprout and grow. People who do not recognize the scars in their lives will not see the purpose of growing their Buddha seeds. The seeds have a hard shell to protect the lotus inside. I heard once that a grave of a Buddhist in the middle of the desert was found containing lotus flower seeds. One person decided to see if it would grow and took it back to Japan. This seed had sat in this grave for over 2000 years in the desert. Once it was planted, it grew! Then the seeds are placed in a glass of pure water. It cannot contain any chlorine or chemicals. The seeds that float to the top are infertile. The water cannot be stagnant and must be changed each day until a sprout begins. The seeds absorb the water and swell to twice their size. In order to grow our Buddha-seed, we must float in the pure spring water of the Lotus Sutra and from this we can grow and start to see our Buddha-nature beginning to sprout. The way a seed reproduces: 3 simple criteria to spread and reproduce members. Received Personally: This has a profound implication; Buddhism/the Lotus Sutra/the Seed must be internalized and must transform the nature of the follower. Repeated Easily: This means it is easy to apply; it must be able to be passed on after only a brief encounter. It must have a stickiness to the pattern that is unforgettable and can be easily passed on to others. Reproduced Strategically: This means it is communicated universally; it must be passed on globally by being translated into a variety of cultural contexts and languages. (Based on simple and reproducible traditions. Through simple exercises to proclaim in physical action the truths of the Lotus Sutra). Question to someone: How do you cope with life? It is important to remember that the teaching of the Lotus Sutra is a Universal Teaching and is meant to be passed on universally. For this reason it should be less about addressing specific problems and more about transmitting its universal principles that can be applied in any context of life. It is important therefore to have a Teacher-Student, Parent-child, or Sovereign-citizen relationship with the Eternal Buddha in a respect-oriented education which is necessary to see natural growth of the Sangha. We have stayed too long in our groups and buildings instead of upholding and expounding the teachings of the Lotus Sutra to the world. We must give each person the opportunity to begin to walk on the path of the Lotus Sutra and to become a disciple of the Buddha. In front of the Buddha what would be your vow? The most important way to spread the teachings of the Lotus Sutra is to understand the pattern that must be lived in our lives as a manifested example of the truth, not just the spoken message of the text. Every new practitioner transformed by this path should become an agent of change for others, a carrier of this medicine. Honmon no Honzon (Gohonzon) - The manifestation of the Universal Truth (Law) as depicted in the correct object of veneration. This is the physical representation of the Hidden Core of the Lotus Sutra. This is the ongoing transmission of the Wonderful Dharma of the Eternal Buddha for the enlightenment of all Sentient Beings. This means purifying ones life with the precept to uphold, keep, and expound this Wonderful Dharma of Myoho 妙法. Walking correctly in our lives by purifying the old and putting on the new. Honmon no Daimoku (Lotus Sutra) - Is the great medicine and catylist that links all beings with the Universal Truth of Myoho 妙法. It is the medicine to awaken and nourish our Buddha-natures and the medicine to be given to others through the realization of the interdependent nature of all beings. This is done by nurturing relationships with others using our lives as manifestations of growing of this truth in our lives and relationships. The words of the title and essence flow into all of our relationships. 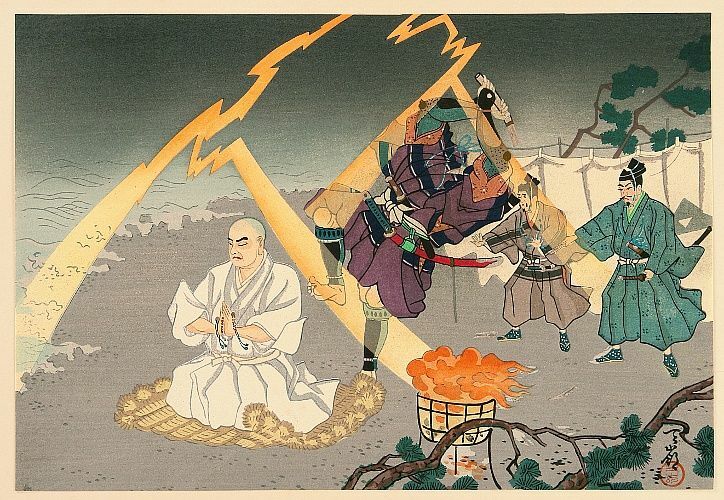 Honmon no Kaidan (Nichiren Shonin) - Is the manifestation of the precepts in our lives and our mission exemplified by our Founder Nichiren Shonin sent as the representative with the Eternal Buddha’s message. We have an important purpose. We have been given a prime directive to fulfill as Bodhisattva’s from underground who this teaching has been transmitted to, to spread to all Sentient Beings. This is divided into two aspects of Shakubuku (Confront) and Shōju (Witness). *In order to launch a new Sangha, there are two things that must be in place in order to call that endeavor an Enkyoji Mission Point Sangha. 1.) We must have a qualified person to serve as Sangha Leader mentored by a Enkyoji Priest or Lay Leader. 2.) We must have at least one community group up and running before its launch. Yes, we want to have regular services, practice sessions, Dharma school and social programs to help the poor and underprivileged in our communities. But we believe that if people are not doing life-on-life study and practice, opening and sharing their struggles and wins, happiness and sadness, ignorance and faith and having deep experiences in their lives with the Lotus Sutra and the power of the Odaimoku, that Sangha will be ineffective to all of the important awakenings that I mentioned above. This is reflected in our 円教寺 Enkyoji Buddhist Network impact statement: Aspire to Enlightenment, Engage People, Awaken the World! We believe that progress should happen in this order. It is essential that the Temples get smaller at the same time it gets larger. Here are some essential questions for someone who is considering becoming a Sangha Leader to think about: Are the members under your support living the teachings of the Lotus Sutra and the Odaimoku in their daily lives? Are you taking responsibility and ownership for connecting other people into the Buddhist community? Together are they moving in the mission of the Lotus Sutra to transform this world into the “Pure Land of Mt. Sacred Eagle”? A good Leader will do all he can to constantly answer in the positive to all these questions. LPG (Life Practice Groups): These groups are created with two to three people, all of the same gender, who meet weekly for personal accountability in the areas of their spiritual growth and development. A group should not grow beyond three but multiply into two groups of two rather than a single group of four. If a fourth person is added to the group, it is recommended that the group should create a second group. This is taking after the Lotus Flower as the seeds have grown the plant becomes heavy it gently falls over and drops the seeds making the potential for another Lotus Flower to grow roots and grow. After the fourth person has demonstrated sufficient faithfulness to the group for two to three weeks, the group should multiply into two groups of two. This can be done in member’s home or public place. Start a Community Group: You will have to be aware and considerate of the area in which you are hosting the meetup. This is to create a community group. A community group leader or leaders will be educated and instructed by a Mentor designated by Cederman Shonin. This is a public place to get people interested in practicing Buddhism and can also serve as a study and practice group. After we have meet and get to know the people in this group we can then invite them to attend a Sangha meeting. Core Group: Once a core group, that is started with the people we have gotten to know we from the meetup community group, then we can work with them to start a Sangha. A Sangha is built of people who are practitioners’ of Buddhism. People can become members through having an official Buddhist Refuge Ceremony. 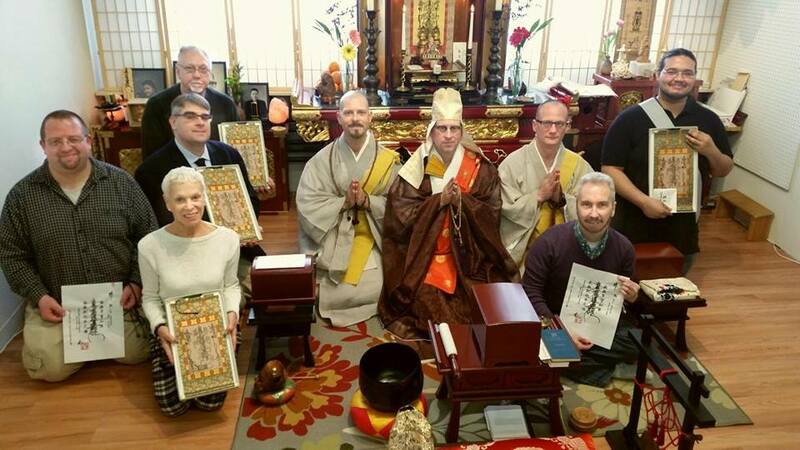 Sangha: A Sangha can be started with the permission of the Head Temple who will then receive a Sangha Charter issued by Seattle Choeizan Enkyoji Temple. Temple: A Temple can be started with the permission of the Head Temple who will then issue a Temple Charter and an official hand written Gohonzon for that temple will be made by our Home Temples Head Priest at Enkyoji Temple in Saga, Japan. What should happen in all these Groups (Including LPG Groups)? In a Buddhist Community, people support, study, practice and encourage each other. In a community group, people can apply the teachings in their lives and be accountable for this in a way that cannot always happen in traditional temple services. A small group is where the teachings given by the Teacher can be direct and studied in practitioner’s lives. “Leaders who develop systems of care and systems of challenge help practitioners live the teachings they vow to follow and contextualize general Nichiren Buddhist truths to specific life situations. In a Buddhist Community, people support and honor each other. One way this happens is by the practicing of the Six Paramitas (Charity, Precepts, Patience, Diligence, Meditation and Wisdom) will be more effective in a small- group situation than in a large traditional Temple Service. In a Buddhist Community, people share with each other. One of the main characteristics of 円教寺 Enkyoji Network Temples and Sangha is the closeness of the community and a family atmosphere. We strive to listen to others rather than speak, help them in their burdens and struggles, have affection for each other’s lives, seeing the Buddha-nature potential in each other. We aspire to abound in compassion for each other, supporting each other in our study and practice.